This page on RF Wafer test and measurements cover RF Wafer Test Equipments and RF Wafer Measurements. As we know wafer testing is performed during the fabrication of semiconductor device. There are many equipments used for wafer testing major among them which interfaces wafer with equipments are wafer probes of various types. The testing involved for the wafer devices working on radio frequencies such as RF LNA, RF Power Amplifier, RF Transceiver, RF Switches and other MMIC devices are known as RF wafer testing. The applications are immense and cover wide variety of technologies based on zigbee, bluetooth, WLAN, GSM, LTE standards. The figure-1 depicts RF Wafer test setup. As shown typical measurement setup covers equipments required to feed the signal input to the device under test(DUT) and equipments required to measure the output from the DUT. The signal generation equipments include vector signal generator, AWG etc. The signal analysis equipments include vector signal analyzer, digitizer, Oscilloscope, power meter, VNA etc. AWG This is used to feed the signal to RF Wafer DUT. It is short form of Arbitraty Waveform Generator. It generates the signal as per user defined waveform file or input. RF VSG It is short form of RF Vector Signal Generator. It is used to provide RF vector signal to the DUT for test purpose. RF VSA It is short form of RF Vector Signal Analyzer. It is used to couple RF output of DUT for various RF and baseband measurements such as EVM, frequency offset, channel response etc. Digitizer It is used to digitize the RF vector signal into baseband IQ files for storage and further necessary signal processing. RF Spectrum Analyzer This equipment is used to view the frequency domain representation of the signal output of the DUT. Oscilloscope This equipment is used to view the time domain representation of the signal under study for various measurements such as frequency accuracy measurement, Jitter, time period etc. VNA It is the short form of Vector Network Analyzer. It is used for S-parameter measurements involving both amplitude and phase. It is also useful for group delay measurement. DMM It stands for Digital Multimeter. It is ideal for measurement of current, voltage, resistance and impedance. RF Switch This module is used to provide switching capabilities between VSG and VSA for test purpose. RF Preamplifier It is used to amplify the signal output. This is often needed for critical 1dB compression point and TOI point measurements. Source Tuner, Load Pull These are third party equipments. RF Power Meter It is used to measure peak power and pulsed power output of the DUT. RF Directional Coupler It is used to couple the RF signal for test and measurement purpose without affecting the main signal path. The microwave probe of various types such as air co-planar transition, ACP series probe and Infinity Series Probe are very popular in RF Wafer testing. They can easily be used to couple coaxial line to co-planar waveguide. They have small contact area and introduces very low contact resistance in the test setup. Figure-2 depicts one of the microwave probe of ACP type used for RF wafer testing. Following table describes RF Wafer measurements. Noise Figure Lesser it is better is the DUT. It is essential for RF LNA test and measurements. Special equipments such as Noise Figure Meters are available for this test. 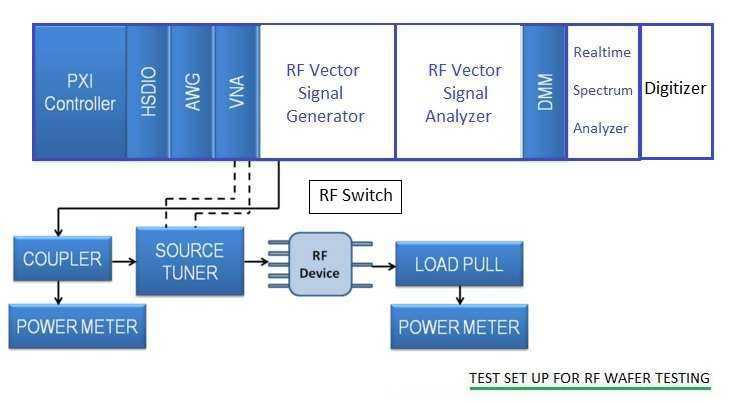 Refer RF LNA Test Procedure➤➤ for this measurement setup. Pulsed Power It is measured using RF Power Meter. Required for RF PA (Power Amplifier) testing. Intermodulation products Required for RF Amplifier, RF Transceiver. P1dB or TOI are the parameters required for this measurement. NEWS and Intermodulation measurements➤➤. Spectral measurements (e.g. ACPR, CCDF) ACPR is the short form of Adjacent Channel Power Ratio and CCDF is the short form of Complementary Cumulative Distribution Function. Refer ACPR measurements➤➤ and CCDF basics➤➤. Modulation Accuracy measurements (EVM, BER or PER) This used as modulation quality measurement as well as system performance under channel and other impairment environments. Refer PHY layer measurements➤➤. RF Phase Noise It is measure of purity of oscillator output or any signal generator output. Required to measure for RF LO, Signal Generator, RF Transmitter, RF Synthesizer etc. Refer RF measurements tutorial➤➤. Group Delay It is required for vector device measurements. Following are the major benefits of RF wafer testing which has made it popular in RF and Microwave industry. • The test setup calibration includes probe tip and hence the measurements are very accurate. This delivers high first pass design. • Reproducibility of test results can be done with ease due to automatic alignment of modern test probes. • Correlation between the wafer test results and module test results are excellent with minimum variation. Modules which use wafer devices should be properly grounded and should be DC biased as biased in the test setup. • Production tests require very less cycle time. • Higher throughput can be achieved in complete automated test setup. This also results into lower cost of testing.